Features: Waistline and top part is well elastic, skirt is made of voile. Perfect Puffy and Comfortable Petticoat- Highly Recommend! Please Use Size Chart Image we offered. Pls don’t use Amazon’s “Size Chart” link. *Waistline and top part is well elastic. *Skirt is made of two layers voile with ribbon edge. Adds the perfect volume to your dress. *The top part can just be hoisted up and down to adjust the length so it would be suitable for most dresses. *Plus one Layer of lining to stop the voile material from scratching your legs. It’s a great shape, not too huge but looks gorgeous under a dress! Perfect for a 1950s dress or skirt. 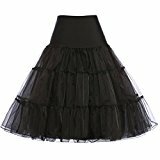 This fabulous Crinoline, just what you are looking for! Yafex products ONLY delivered by Yafex or FBA. And we have our own trade mark! If you buy Yafex products from other delivery channel, Yafex disclaim any responsibility for your purchasing. Thanks!